For more than twenty years, major innovations—the kind that transform industries and even societies—seem to have come almost exclusively from startups, despite massive efforts and millions of dollars spent by established companies. 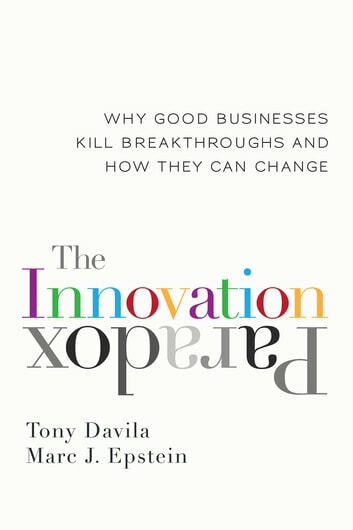 Tony Davila and Marc Epstein, authors of the bestselling Making Innovation Work, say the problem is that the very processes and structures responsible for established companies’ enduring success prevent them from developing breakthroughs. This is the innovation paradox. Most established companies succeed through incremental innovation—taking a product they’re known for and adding a feature here, cutting a cost there. Major breakthroughs are hard to achieve when everything about the way your organization is built and run is designed to reward making what already works work a little better. But incremental innovation can coexist with breakthrough thinking. 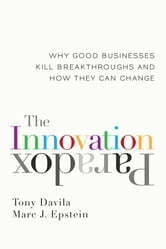 Using examples from both scrappy startups and long-term innovators such as IBM, 3M, Apple, and Google, Davila and Epstein explain how corporate culture, leadership style, strategy, incentives, and management systems can be structured to encourage breakthroughs. Then they bring it all together in a new model called the Startup Corporation, which combines the philosophy of the startup with the experience, resources, and network of an established company. Breakthrough innovation no longer has to be the nearly exclusive province of the new kids on the block. With Davila and Epstein’s assistance, any company can develop paradigm-shifting products and services and maximize the ROI on its R&D.